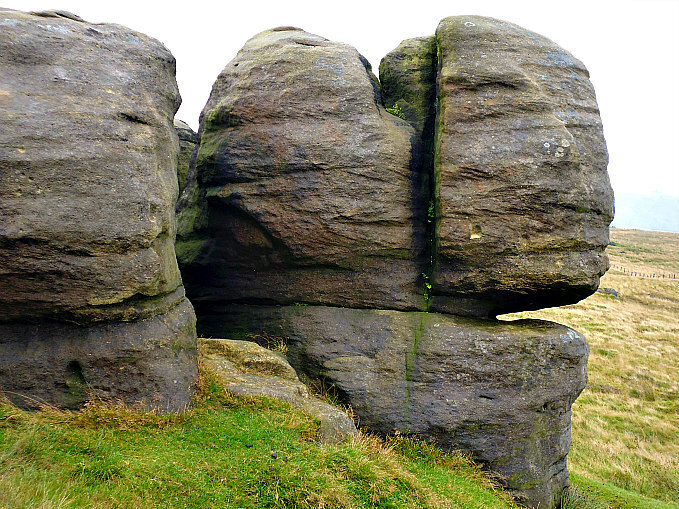 Bride Stones, west Yorks (Sphinx- like formation). OS grid reference: SD 9334 26750. 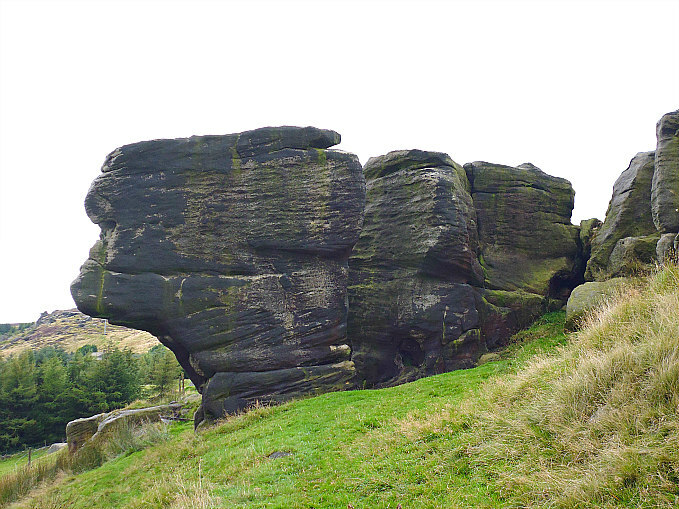 Close to the Long Causeway and just east of Todmorden, West Yorkshire, are the Bridestones, outcrops of millstone grit rocks and boulders which are ½ a mile long. Amongst these rocky outcrops are a number of odd-shaped formations that have been caused by weather-related erosion over thousands, if not millions of years. 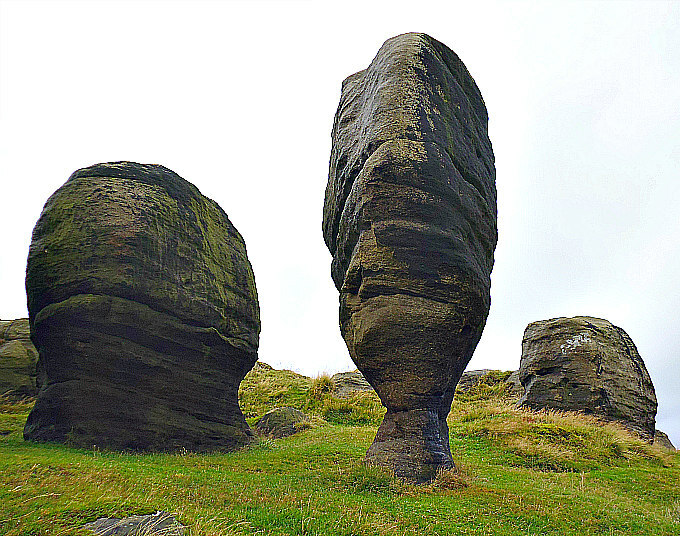 One huge boulder in particular, known as ‘The Great Bridestone’ is fantastically shaped at its base, looking like an up-turned bottle, as if it might topple over at any moment. There are a number of myths and legends associated with The Bridestones, many of these going back to the mists of time. More recently, perhaps, there are a number of local traditions that have become connected to the place and its many, strange-shaped rocks and boulders. 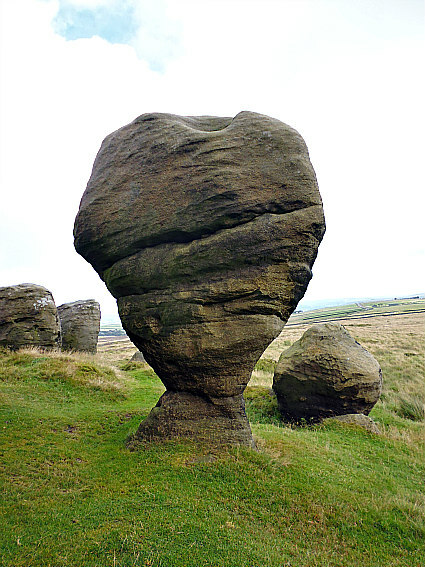 The Bridestones are located about ½ a mile north-east of Eastwood Road – where a footpath runs across the often boggy moor to the outcrops. Another path connects the north-side of the outcrops from Kebs Road, and from just opposite Orchan House Farm at Fast Ends – it runs in a southerly direction across Bridestones Moor. Bridestones (human face rock formation). 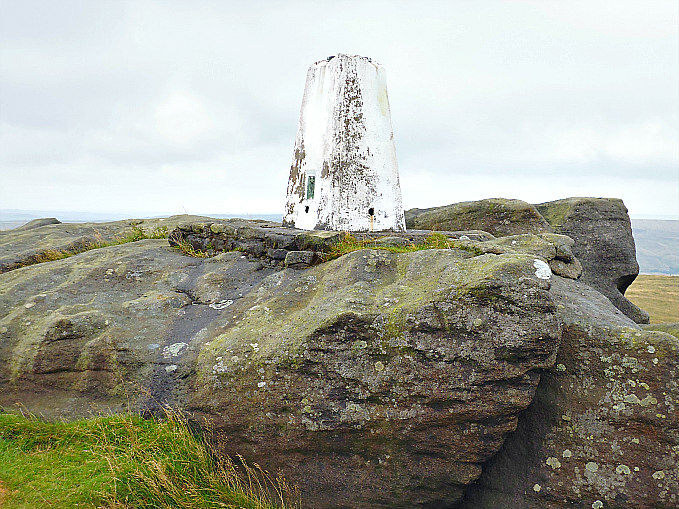 At over 1,400 feet above sea-level the Bride-stones on the windswept moors to the east of Todmorden and the Calder Valley, there is a ½ mile long escarpment of Millstone Grit outcrops that stand like rocky sentinels keeping watch over the Pennine moorland. These rock forma-tions have been made by the ‘ravages of time’ – wind and rain over thousands of years weathering away the soft grit-stone into strange and curious shapes, and there are indeed some strange-shaped rocks – some looking like human heads and faces (the sphinx), while others look like prehistoric birds, a giant tortoise, and a bear, and there’s even a huge anvil-shaped rock. 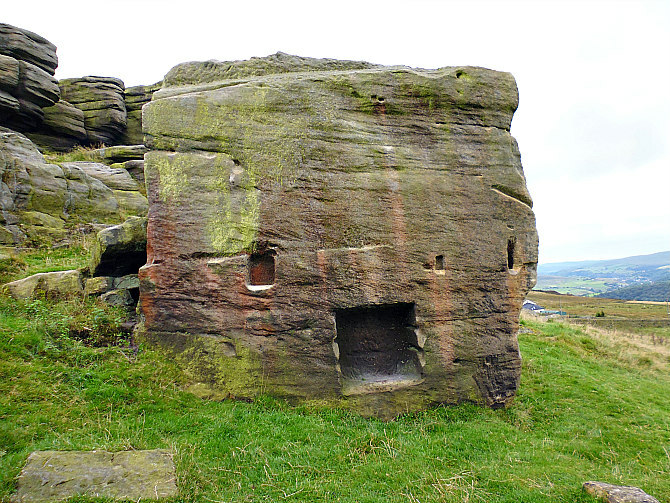 Bridestones, west Yorkshire (the rock-house). Bridestones, (a “possible” cup-marked rock). There is even a ‘rock-house’ at Fast Ends above Bridestones Farm at (OS grid ref: SD 9277 2690). Local legend says that Nan Moor and Jack Stone lived at the rock-house a few hundred years ago as ‘guardians of the stones’, and they were proba-bly married there, too. They are said to have lived in a wooden structure or homestead that was connected between the two large rocks; one of the oblong-shaped rocks having square-shaped openings in its side, which must have taken a great deal of time to carve out. This wooden structure was dismantled in recent times. 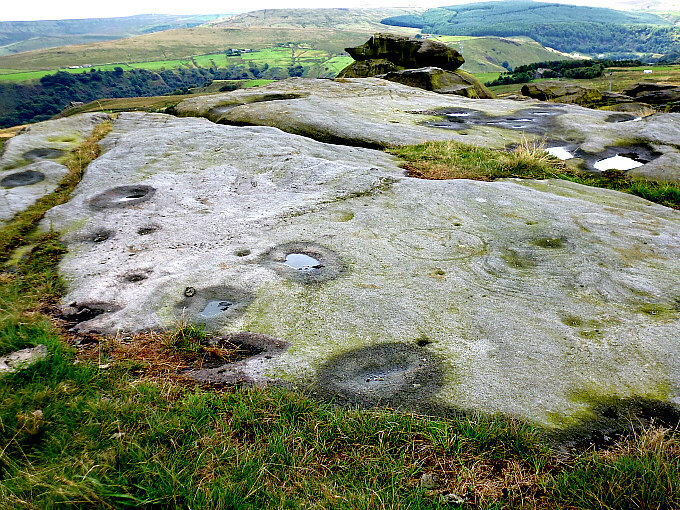 Just above the rock-house there are some large, flat rocks which look to have ancient cup-marks but there are also larger, circular depressions that are naturally-formed by rainwater – although it’s sometimes difficult to tell which are natural and which are man-made! And there are many interesting rock basins to be seen. Great Bride Stone stands like an up-turned bottle. Great Bride Stone (from a different sideways angle). The name ‘Bridestones’ might be derived from Bridia, Brighid, or Briga, the pre-Roman (Iron Age) diety who is more often known from history as ‘Brigantia’, goddess of the Brigantes tribe of northern England – just prior to, and up to, the Roman Conquest. Or they “might” perhaps take their name from bride as in ‘bride and groom’ at a wedding ceremony, which harks back to times, long ago, when weddings supposedly took place on the moor where the outcrops of rocks now known as ‘Bridestones’ are located. Indeed there is a 15 foot high oval-shaped, weathered rock called ‘Great Bride Stone’ and beside it a smaller rounded rock called ‘the groom stone’. But undoubtedly the Bridestones was a sacred, magical place, and no-doubt a few thousand years ago it was the abode of druids who worshipped heathen gods and also officiated in ritualistic and sacrificial ceremonies, but aside from that they were also poets, historians, magicians, physicians and astronomers. Billingsley goes on to point out that: “Taylor [Ian Taylor, 1993], has suggested an identification of Bride with ‘the Old Wife’ or Gaelic Cailleach, a traditional spiritual denizen of wild places more usually associated with the Irish goddess Danu; a local appearance of this hag figure may well be the Old Woman. “The Bride has also been locally known as the Bottle Neck. Other rocks have been given names, too, arising from one perception or another. Modern climbers have named rocks themselves, like the Indian’s Head and Spy Hole Pinnacle, as well as giving equally vivid names, like the Obscene Cleft, to specific routes. F.A Leyland cites names known in the nineteenth century, like Table Rock and Toad Rock. “John Watson knew of the Bride and Groom in 1789, but does not give details of the legend, other than saying the Groom had been “thrown down by the country people”. In keeping with the spirit of the time, however, he saw the rocks as the natural haunt of “a large settlement” of Druids – “a vast variety of rocks and stones so scattered about the common, that at first view the whole looked something like a temple of the serpentine kind”. Author Paul Bennett in his work ‘The Old Stones of Elmet’, says of the Bridestones that it is: “A beautiful, remarkable and powerful site of obvious veneration. First described in local deeds as early as 1491, there are a great number of severely weathered boulders all round, many like frozen giants haunting a magickal landscape. “Dedicated to Bride, goddess of the Brigantine people, like her triple-aspect we find a triple-aspect to the outcrops here: to the west are the Bride Stones; to the east, the Little Bride Stones; with the Great Bride Stones as the central group, surveying everything around here. The goddess’ divine qualities were those of healing, smithcraft, poetry, and mother-hood. There is no attendant lore here that relates to any of these elements. “Although local history records are silent over the ritual nature of these outcrops, tradition and folklore tell them as a place of pagan worship. People were said to have married here, although whether such lore evolved from a misrepre-sentation of the title, Bride, is unsure. In the present day though there have been a number of people who have married here in recent years. Billingsley, John, Folk Tales From Calderdale, Volume 1, Northern Earth, Mytholmroyd, Hebden Bridge, West Yorkshire, 2008. Boswell, Geoff, On The Tops – around Todmorden, (Revised Edition), Delta G, Hollinroyd Farm, Todmorden, 1988. 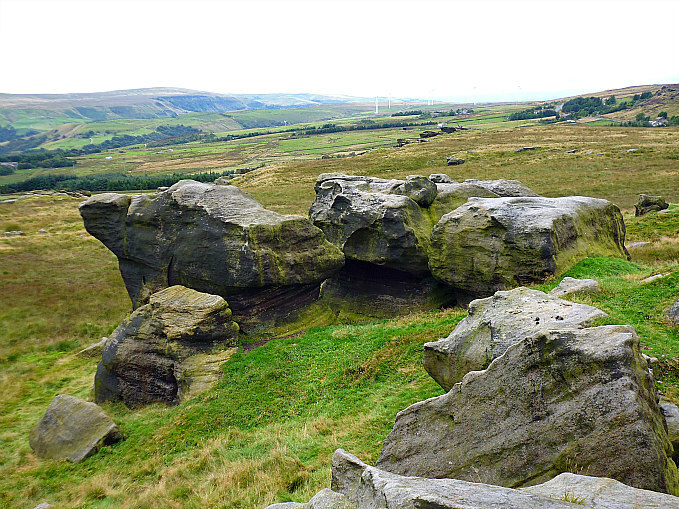 Categories: Myths And Legends, Natural Rock Formation, Natural Stone Or Other | Tags: The Bridestones near Todmorden in West Yorkshire | Permalink.